“Impact investing can be a vehicle to fund, catalyse and scale approaches that improve millions of lives. India is an opportunity-rich environment and is emerging one of the most attractive markets for impact investing worldwide,” says a McKinsey report titled Impact Investing: Purpose-driven finance finds its place in India. According to the report, impact investments – that meet the needs of the base of the pyramid population in a range of sectors such as healthcare, education, financial inclusion, agriculture and clean energy – cumulatively totalled $5.2 billion since 2010, with 2015 being the turning point, when that year alone the investments touched the $1-billion-mark. In 2016, the investments totalled $1.1 billion in India; the value of annual global impact investments topped $22 billion that year. Much of the growth in India, the report says, has come from a doubling or more of average deal size, which rose to $17.6 million in 2016 from $7.6 million in 2010. “The volume of deals has remained stable at about 60 to 80 a year, demonstrating the emphasis on scaling new models of impact,” it adds. The McKinsey report says that high demand for investments is likely to continue because of the increasing population, underlying economic growth and large unmet social needs. 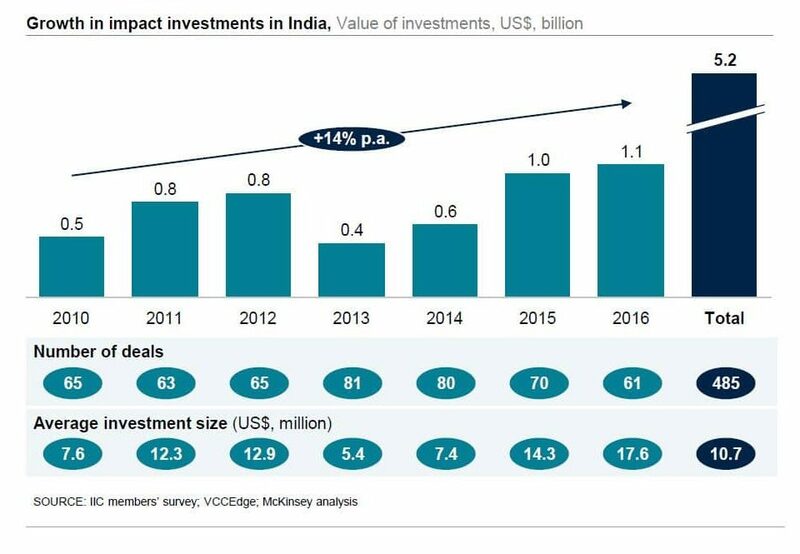 McKinsey believes that impact investments in India have the potential to grow 20-25 per cent a year between now and 2025, reaching $6-8 billion by 2025. Different types of investors are now involved in impact investing, with varied expectations of risk and return, different strategies and portfolio approaches, says the report. The investors have persisted despite setbacks, as in the micro-finance and clean energy sectors. McKinsey sees four distinct trends shaping impact investing in India. One, there will be diversified and complementary sources of capital, with impact investors being joined by conventional venture capital and private equity firms. While impact investors funded nearly two-thirds of the total deals by volume, including co-investment deals with traditional PE funds, these deals accounted for a little over half of investments by value. Two, there has been a spurt in deal size over the last three years. Also, the increased collaboration between traditional impact investors and PE/VC firms, is helping enterprises in the impact sectors get funding across their lifecycle. There has been a diversifying sector spread, with more money being pumped into sectors such as financial inclusion and healthcare and the share of clean energy coming down. Overall, says the McKinsey report, as the industry matures and there are more exits and investors realise returns, there is a convergence on criteria necessary for social investment. Globally, according to the report, several traditional investors, including TPG, BlackRock and Bain Capital, have announced separate units for impact investments. Emerging markets account for about 45 per cent of assets under management, with Asia and sub-Saharan Africa making up 22 per cent. The impact investors active in India include Lok Capital, Unitus Ventures (formerly Unitus Seed Fund), Elevar, Accion, IntelleGrow, Menterra, Ankur Capital, Omidyar Network, Aavishkaar and Intellecap Impact Investment Network. Unitus Ventures (formerly Unitus Seed Fund), one of the leading impact investors in India, in its semi-annual (January-June 2017) impact report has said its active portfolio of 14 companies has directly impacted over 1.2 million base-of-the-pyramid lives in India (596,000 in the same period last year), created over 6,200 (3,086 in the corresponding year-ago period) sustainable jobs. The fund’s portfolio companies have registered a 106 per cent year-on-year growth in revenues at $21.8 million ($10.6 million) and have raised 3.6 times additional capital since Unitus’ initial investment. Unitus says the one million landmark is significant for the investing ecosystem as it shows the scale of impact a seed-stage fund can achieve in five years. Unitus invested in 23 ventures out of its first fund of $23 million in sectors such as education, healthcare, fintech, retail and e-commerce, mobile and agriculture. Unitus Ventures (formerly Unitus Seed Fund) is in the process of closing its second fund of $50 million, which it will use to invest in 25-30 start-ups in education, healthcare and financial technology. Its portfolio includes ventures such as Hippocampus, LabInApp, Curiositi, CueMath, Milaap and DriveU. This article was originally published in The Hindu BusinessLine.